A friend living in Rome will go and check where in the square they’ve placed the plaque, whether it’s close to the bookshop. In Campo de’ Fiori you’ve got the best bookshop of Rome—I’m a customer myself. That bookshop is called… Farenheit 451. I work since almost 30 years and censoring and cataloguing the folios and bifolios of Hebrew manuscripts in parchment re-used as ligatures, especially starting from the mid of the 16th century. This phenomenon is a part of the general history of the production of the book, and was caused by the revolution caused by the printing press, when the printed book competition against the manuscript caused the collapse of the manuscript and its exit from the market of the book. This was because the press was able to provide the most requested works at a price fifty or a hundred or even more times cheaper than the cost of a manuscript. Not only the Hebrew manuscripts ended up in such a way, being dismembered and reused as bookbinding, but also any code written on parchment and in every language, including Christian text as the Gospels, patristic commentaries, and other codes written in Greek, Latin, or in vernacular languages as French and Italian. But this general phenomenon, only for the Hebrew book fell in coincidence with the start of a harsher persecution of the Catholic Church against the Jews and their books. The bull of Pope Julius III of 1553, which ordered the confiscation and burning of all copies of the Talmud, after Rome was extended to many other Italian cities. These confiscations produced large quantities of books, either handwritten or printed, to be burned. Of course, since it was started a few before a real business of reusing the parchments of old codes that was no longer interesting, someone escaped from the pyre of books to be burnt those in parchment, in order to get some money in selling them to the binders instead of burn them. This is confirmed by my study of about 370 sheets and bifolios of the Talmud found in bookbindings, I was able to reconstruct in some 160 Talmudic manuscripts otherwise completely lost, and survived only thanks to their reuse to make ligatures. See for that M. PERANI and E. SAGRADINI, Talmudic and Midrashic Fragments from the “Italian Genizah”: Reunification of the Manuscripts and Catalogue, Giuntina, Florence 2004. I studied the folios and bifolios of Talmud according to the date of their re-use that I can know from the first year of the acts of the notary or of the person who compiled the register, bound from the Talmud. I can tell you that for sure there is a connection between the confiscation of Talmud followed the papal bull of 1553 and the abundance of Talmudic codes in parchment to be reused. In fact, a diagram of Talmudic Fragments According to date of reemployment, shows a clear peak in the fifties of the 16th century, corresponding to the Confiscation of the Talmud ordered by Pope Julius III. I’ve seen hundreds of beautiful Sephardic codes, copied from the Jews in the Iberian peninsula one, two or three centuries before the expulsion, which, after being brought from exile to Italy in 1492, after their confiscation they escaped the fire and ended to be reused as a binding material. Similarly, many Ashkenazi Talmud codes, and even rare manuscripts of the Talmud Yerushalmi copied during the 11th century in southern Italy by copyist of the Otranto rabbinic academies, after being transported in northern Italy, they were reused in Bologna in bindings of notaries. If someone helps me to put on this site a PowerPoint presentation on this research, I’ll do it gladly, to make it available to everybody, such as an article of mine in English on the reuse of Hebrew manuscripts in parchment as bookbinding. Mauro Perani. I saw the plaque today, and was very irritated to see that it was totally unprotected and almost illegible from the filth of the market. I think it is worthy of much better care. Perhaps raised a few centimeters from ground level and a clearer explanation of why it is there. 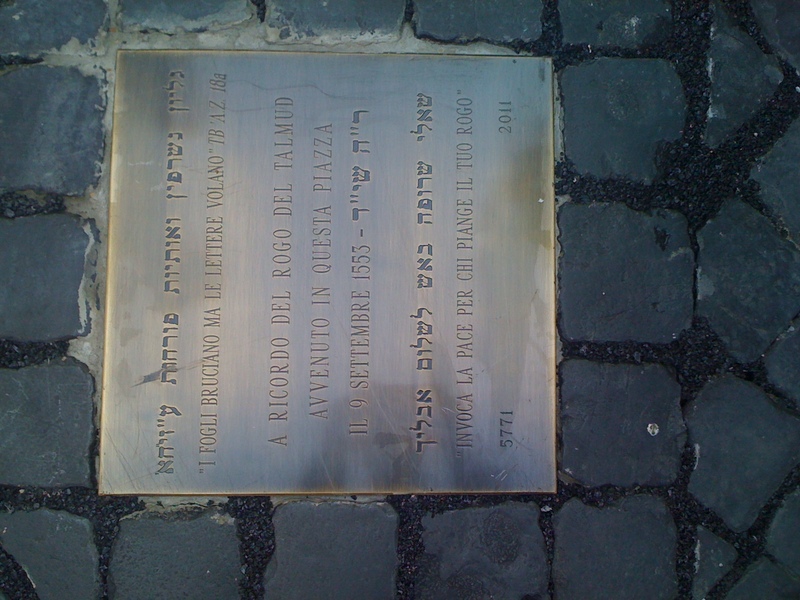 saw the plaque last month with my family – am trying to find a good english translation – does anyone have one?